Flattering50: Fashion Over 50: At Last, A Designer for Us! Marla Wynne Ginsberg, 56, is living the dream of many over 50 women. After a successful career as a television producer, she’s embarked on a new adventure as a fashion designer. I’m a huge fan of any woman over 50 who reinvents herself. 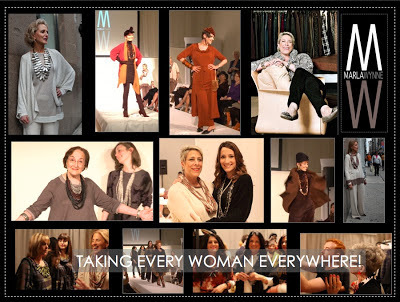 But what makes Marla's reinvention so exciting is she’s chosen to design clothing for us—women over 50! On the MarlaWynne site, the designer tells us her clothing is easy care, easy wear and easy elegance. Sounds perfect, doesn’t it? Recently, I had a chance to chat with Marla. She’d just completed a successful runway show in New York City and was gearing up for three shows on the Home Shopping Network (HSN) at the end of October. I asked her about her latest collection and her design philosophy. Naturally, I couldn’t wait to share all with Flattering50 readers. Click “read more” below to learn more about Marla (that's her above) and her designs. 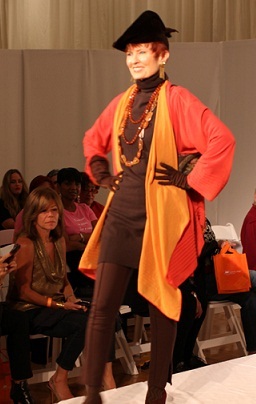 Marla also wanted to create clothing that was comfortable, easy to wear. “At our age, most of us have icky bits we want to cover up,” she said. “My clothes are cut to fit our bodies. They flatter all figures--from sizes 0 to Plus.” While many of the garments in the Marla Wynne collections have lovely draping, there are also fitted pieces. “The rule in fashion is when your top flows, your bottom piece should have structure.” Comfortable fabrics are also important to Marla. “I use a mix of natural and synthetic materials that breathe.” The fabrics are washable and perfect for travel. 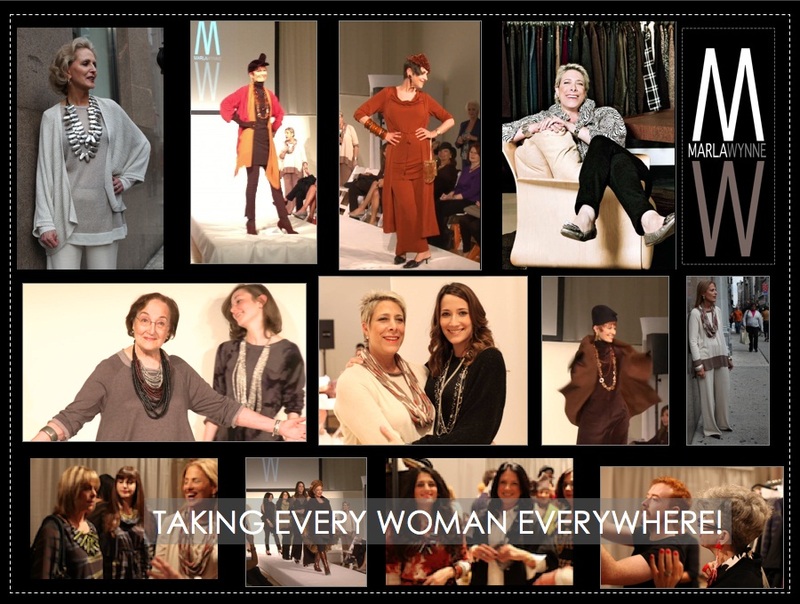 “During trunk shows, I’ll pulled 10-days-worth of clothes out of a bag or small suitcase,” said Marla. Sophisticated and easy to wear—what more could an over 50 woman want in a garment? Well, price point, of course. Once again, Marla comes to our rescue. “Women with money, regardless of age, have options when it comes to shopping for fashion. They can buy Eileen Fisher,” noted Marla. “But not everyone can afford Eileen Fisher. 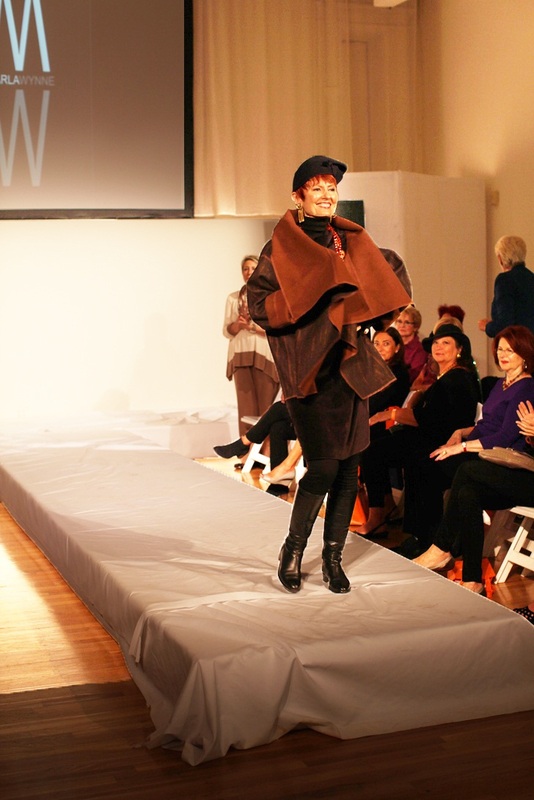 There’s not a lot of reasonably-priced fashion that is cool and fabulous for women over 50.” According to Marla, her collection matches the quality of Eileen Fisher, but not the price tag. “My clothing is well-made, which means you won’t have to throw it out after a season.” She also pointed out that the price tag for each garment is the same for all sizes. Clearly, Marla understands what's important--namely, quality, style, comfort and price--to women over 50. And this over 50 woman is rooting for her success. To view the rest of Marla's designs, visit MarlaWynne and tune into one of her Home Shopping Network shows on Oct. 29th and 30th. To learn more about the woman behind the fashion, take a peek at a recent profile, titled A Designer Just for Ladies of a Certain Age, at My San Antonio.com. And if you have a second or two, click the comment box below and tell me know what you think of Marla's collection. Thanks!